Through my 17 years of practising Yoga and my 10 years of teaching, I have witnessed just how significantly peoples’ lives are improved by Yoga, including my own. When I first started practising I had a great deal of pain in my body, particularly in my hips and back. I also felt overwhelmed about being a mum of a boisterous 2 year old boy. The Yoga, over time, allowed my body to become pain-free, energised and much more flexible and strong. Emotionally, spiritually and mentally I felt (and continue to feel) calmer, more in balance, have a greater sense of inner resources (able to deal with life’s challenges) and a sense of joy, harmony and trust in Life. I also know that Yoga has supported me to release old emotional hurts that were stored in my body. From my experience of teaching I know that my students also feel transformed. Yoga has an accumulative effect – the more you practice (generally speaking) the better, on all levels, you feel. 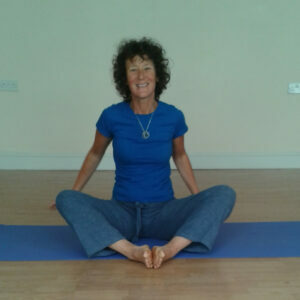 I’ve trained with the British Wheel of Yoga and the Inner Yoga Trust and I continue to regularly update my practice. I am passionate about Yoga and love to share my enthusiasm and knowledge with my students. How could I not ? I have a background in nursing, social work and massage so bring the qualities of nurturance, compassion, care and an intuitive reading of bodies to my classes. Are you feeling tired, achy, stiff and stressed ? Think that you are not flexible enough to do Yoga ? Do you long to feel free of tension and niggles, supple, calm and uplifted. ? For those who have some experience of the practice. You may have completed a beginners course of yoga with Lisa or with another teacher. You may be someone who is wishing to rejoin a class after a break. Please do contact Lisa if you have any questions and to discuss your needs. In this class, Lisa takes a medical history and is able to give some individual instruction and adjustment, as required.